Join the ICCA Community on Sat. 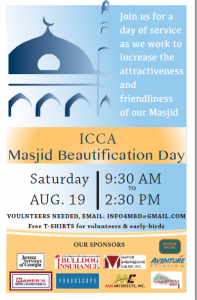 Aug. 19th from 9:30 AM- 2:30 PM for Masjid Beautification Day. Alhamdullilah we’re blessed with our masjid and our community. Come join us for a day of service as we work to clean and improve the masjid. Please see the flyer for details.